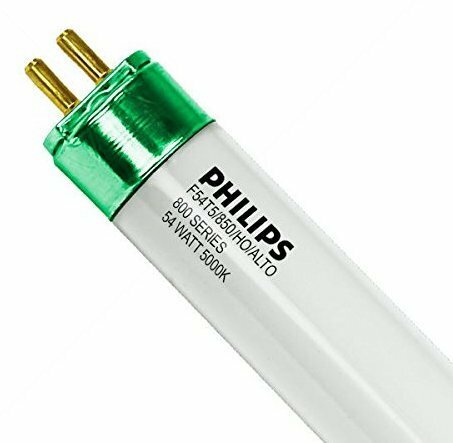 This Philips 54-watt Natural Light Linear Fluorescent light bulb brightens laundry rooms, bathrooms, garages, basements, or workspaces. Versatile for multiple applications, this 4100-Kelvin Fluorescent bulb is suitable for indoor, commercial, and residential use. Features a Miniature Bipin base. Low-mercury design creates a smaller environmental footprint. Philips reuses as much glass and packaging material as possible, reducing environmental impact. Lamp life of 25,000 hours. This product ships as a 40-pack and comes with a 3-year warranty. This Philips 54-watt Natural Light Linear Fluorescent light bulb brightens laundry rooms, bathrooms, garages, basements, or workspaces. Versatile for multiple applications, this 4100-Kelvin Fluorescent bulb is suitable for indoor, commercial, and residential use. Features a Miniature Bipin base. Low-mercury design creates a smaller environmental footprint. Philips reuses as much glass and packaging material as possible, reducing environmental impact. Lamp life of 25,000 hours. This product ships as a 40-pack and comes with a 3-year warranty. If you have any questions about this product by Philips, contact us by completing and submitting the form below. If you are looking for a specif part number, please include it with your message.